The results are in for the 9th Annual Ontario Brewing Awards presented by Toronto’s Festival of Beer! The Gold, Silver and People’s Choice Awards, presented at Beer Academy in Toronto, were given out by Roger Mittag, the “Professor of Beer” on Thursday, May 17th. The annual award ceremony has become a tradition for beer lovers around the province, giving them a chance to meet the people that make their favourite brews as well as allowing them to test out something entirely new. 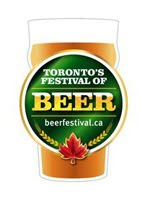 Toronto’s Festival of Beer is scheduled from July 27-29th at Bandshell Park, Exhibition Place. Festival hours will be: Friday, July 27 - 4:30-11pm, Saturday, July 28 - 1:30-8pm, Sunday, July 29 - 1:30-8pm. Tickets are now available online at: www.beerfestival.ca. Patrons must be of legal drinking age (19+) to attend and children and pets are not permitted on-site at the Festival. Eska Water has signed on as the official water sponsor for TFoB. To ensure that the festival remains a safe and fun experience, Eska Water will be providing bottled water free of charge to all patrons at the festival. Drinking and Driving is never a tasty mix! Please drink responsibly. For more information, please visit www.beerfestival.ca.